This is a new edition of the most successful Chinese medicine textbook ever published in the English language. The book covers the theory of traditional Chinese medicine and acupuncture, and discusses in detail the use of the acupuncture points and the principles of treatment. The material is based on rigorous reference to ancient and modern Chinese texts, and explains the application of theory in a Western practice context. The new edition includes additional new material, as well as revised chapters, as detailed below. In particular, 50 more acupuncture points are discussed, and further patterns (as well as some combined patterns) have been added. More case studies and case histories have been included, and pinyin equivalents have been added to key terms. Additional information is given on pathological processes and factors; principles of point prescribing; diagnosis, especially pulse diagnosis; the relative weighting of symptoms; identification of patterns according to the Four Levels and the Three Burners; channel theory; Warm and Cold disease; and vital substances. The glossary has been considerably expanded. In addition, the text presentation has been redesigned to make it even easier and clearer for students to navigate around the chapters. A second colour has been introduced, and more drawings, diagrams and tables now supplement the text. Summaries are included at the beginning and end of each chapter, and icons have been added to support the clarity of the text. A CD-ROM is also included with the book, and it contains over 750 self-testing questions in a variety of formats. The students have the option to be marked electronically on their answers. Also included are 65 full colour surface anatomy images as an additional resource. "The text is beautifully presented in two colours. A large number of clear illustrations and text boxes highlight the important points and aid readability. Learning outcomes are summarised at the end of each chapter. 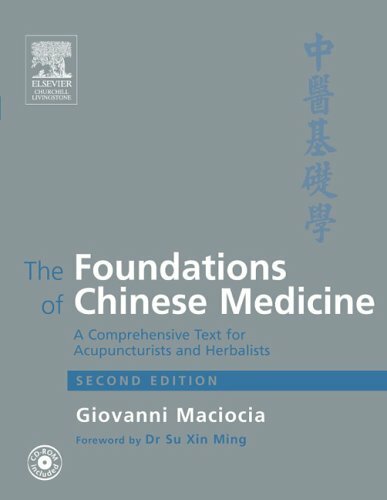 This is a well designed and easy to read textbook, which sources mainly from the classic Chinese medicine texts, including both ancient literature and modern books. It benefits from the author's rich experience in clinical practice in the West and his training in China. An in-depth understanding of the principles and theories of TCM enables the author to explain this complicated ancient healing system in a way that is understandable to Western students.